Project of construction of these wind farms is one the largest industrial investments in Sweden. The investors are Norwegian Statkraft SCA Vind AB, SSVAB, and Sweden SCA. The investors plan construction of seven wind farms, and the total value of the investment is 2.4 billion USD. Complete project shall include surface of 136 km2 with 360 wind turbines and combined production of energy of 3 TW in a year. For connection of new wind farms with transmission system construction of new 130 kV transmission lines is necessary. The new transmission lines shall enable connection to the network E.ON Elnäta Sweden with totally installed power around 1000 MW. In the part of construction of new transmission lines, the Elnos Group executed works of mounting and lifting the poles and installation of conductors on transmission lines: 2×130 kV Storfinnforsen-Ögonfägnaden (Phase 1) and 2×130 kV Ogonfägnaden – Isbillstjärn (Phase 2). For the needs of this project all our employees passed in Sweden special trainings for work in the zone of wind farms. 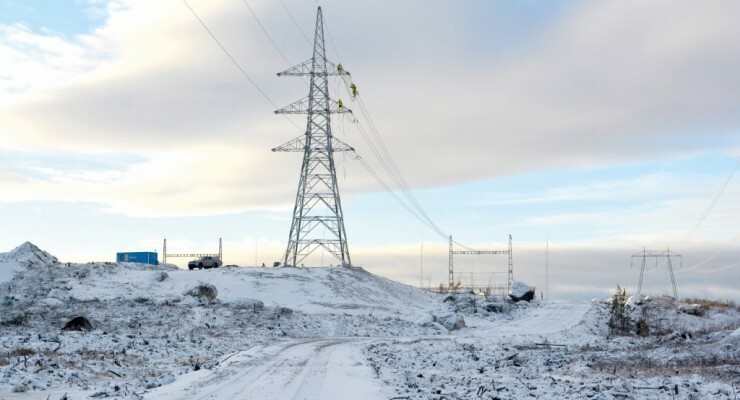 In the middle of February 2014, 8 days before the deadline, works were finished on transmission line 2×130 kV Ögonfägnaden– Storfinnforsen. The length of the section of the transmission line is 16.06 km. 69 poles are mounted and lifted on the section on which phase conductors Al-59 774 mm2are installed. Finished works were performed in extremely difficult weather conditions, at -30o C.
Phase 2 of this project was performed in much better weather conditions and the project was completed a month before contracted dead­line. Total length of TL 2×130 kV Ögon­fägnaden–Isbillstjärn is 8.9 km long. On this TL we assembled and erected steel-lattice tow­ers and installed 910 mm2 conductors and 142 mm2 earth-wire. All towers were double-system with vertical phase arrangement.